Missteps cause frustration, confusion and - worse yet - make your team hate the new tool that was supposed to help them. Not to mention inaccuracies in data collection can undermine the trust designers have in the data used during project design. 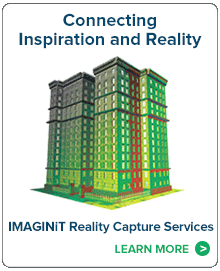 Based on nearly two decades of implementing reality capture workflows and technologies for a variety of organizations, IMAGINiT created the SmartStart program - the essentials for success. During the SmartStart, an IMAGINiT expert will educate your field and office personnel on how to setup the Leica BLK360, best practices for field collection, using the Autodesk ReCap 360 Pro mobile interface and more. At the completion of your SmartStart, your field and office design staff will be fully prepared to use the BLK360 and Autodesk ReCap 360 Pro to collect accurate field data, efficiently process that data, and use it to its greatest benefit within your current and future projects.